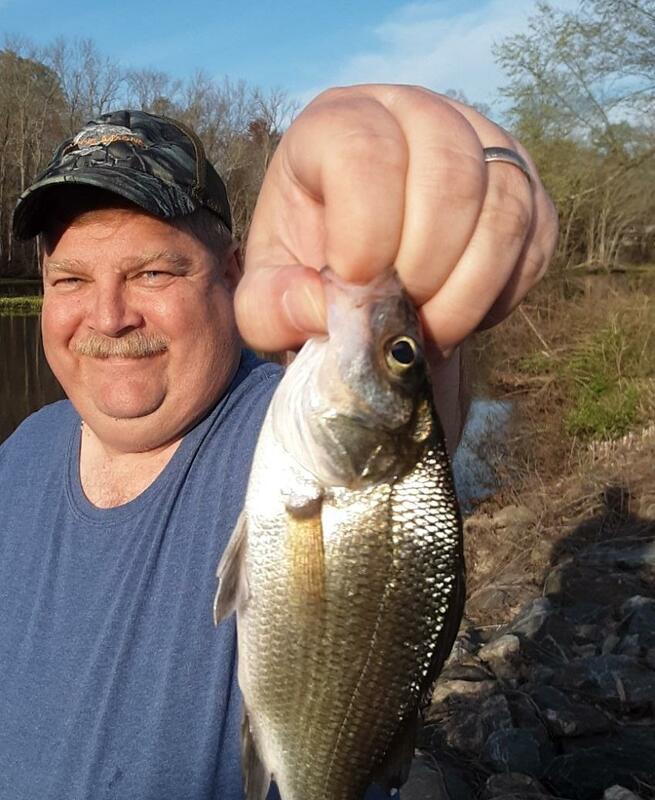 Well as some folks on this forum know I have been trying to get Livie and I out to a local creek that has a large run of white perch (Maryland's smaller cousins to the white bass runs in the Ozarks). We have not been successful until last week. We decided to go out after work last Weds. The tide was near low tide but the water was running clear. There was a mostly sunny sky. We saw a big turtle on the bank as we pulled in which excited Livie greatly ! I have been trying to hit the incoming or falling tide right after high tide. So I did not expect much luck. I had success with a white and chartreuse trout magnet and caught one of the river herring species. So I had on a chartreuse and white microjig on 2# Pline. Livie had on a 1/16 oz Thinfisher silver spoon. Along the rocks we were seeing small groups of minnows that could have been new species or ones that we had not caught yet this year. However we still were trying for larger fish. 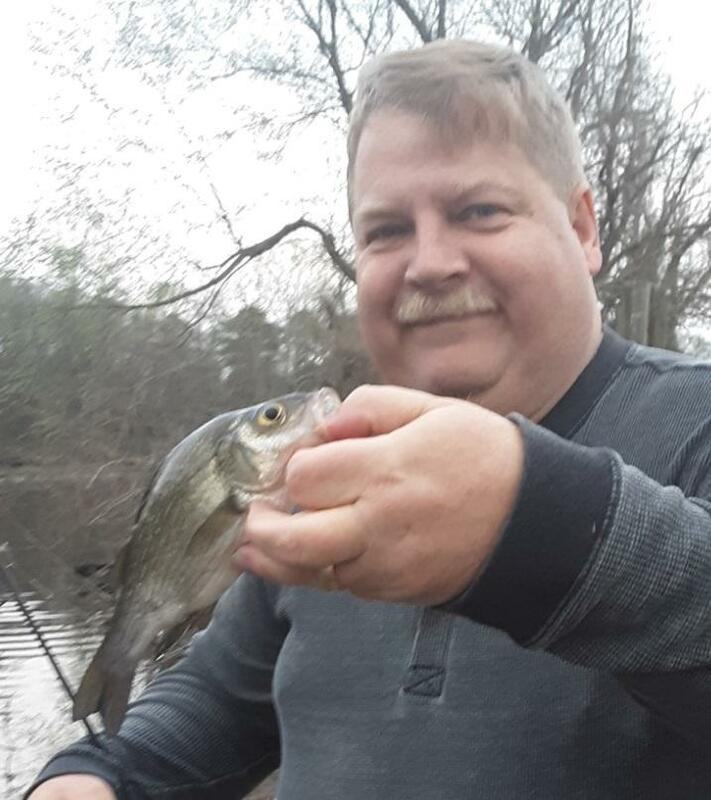 I got on the board first by casting out beyond a rock pile that I could see from the bank and where I have caught whites before. It wasn't a white but a satinfin shiner - possibly one of the minnows we had been seeing and a new life list species for me ! Livie had never fished this spoon before and felt like she kept hitting bottom, but it turned out that she was getting bit. She landed her first white perch of the year! Since she felt bad that I had not caught one yet this year she let me use her rod and she took mine. She caught a few redbreast sunfish while I was getting a feel for the spoon. I soon caught my first white of the year! We caught a few more whites, but still were not really catching them if they were on the run. Livie switched to micros and tied on a #18 hook and fished a worm. She caught over a dozen redbreast but the minnows remained elusive and seemed to disappear once it was getting dark. At one point she nearly stepped on a thick water snake. 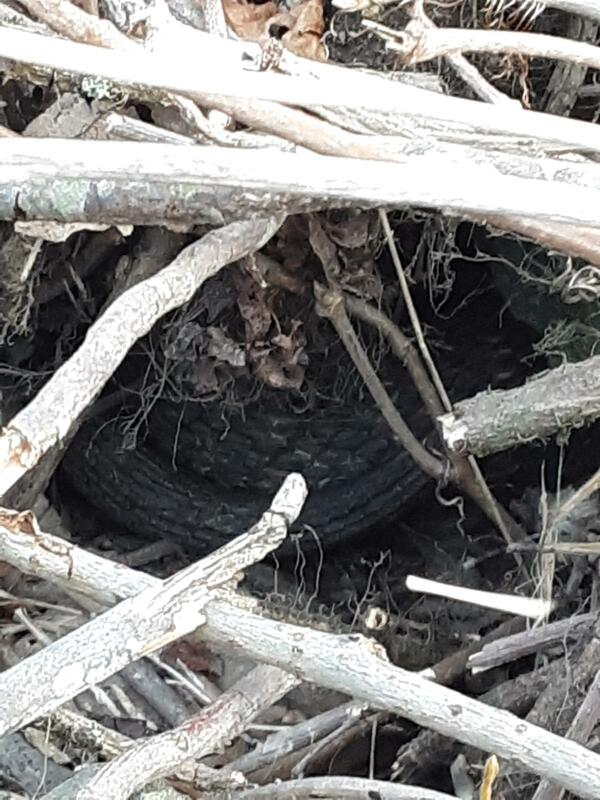 Only got a photos as it got up under a rock and brushy area. At the end of the trip (just a couple of hours of fishing) Live had 18 fish to my 13. I kept thinking about those minnows and we decided to go out again on Thurs. We had to run an errand and didn't get on the creek until 6:50 pm. The tide was even lower than Weds. The sky was overcast and there was a bit of a wind. Livie started with a white/chartreuse trout magnet on the 2# line. I started with a blue/silver Thinfisher spoon on 4# PLine. 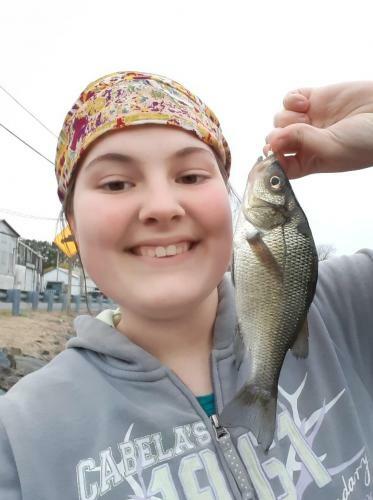 Livie caught a nice male white perch on her first cast. 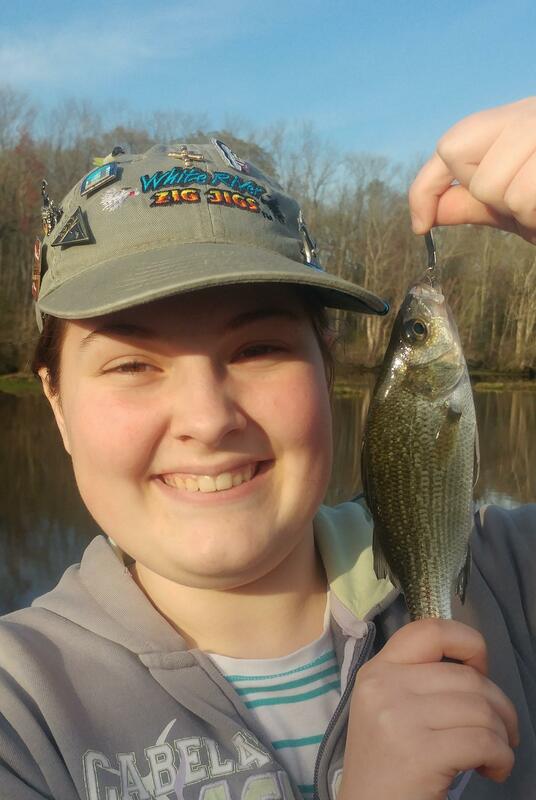 Livie caught a couple more white perch (actually had five fish before I caught my first on the spoon). I finally caught a redbreast sunfish on the spoon as Livie was reeling in a yellow perch. I caught a couple more sunfish as she started trash talking me and trying to set up a competition. Since I am not a dummy, I switched to the trout magnet and caught my first white of the night. It turned out that not only did she had the right bait, the spot that she was fishing also held a school of a perch. We shifted upstream that both of us could fish that same hole. Just as I started catching up, Livie got a good bite and a couple of pulls on her drag. 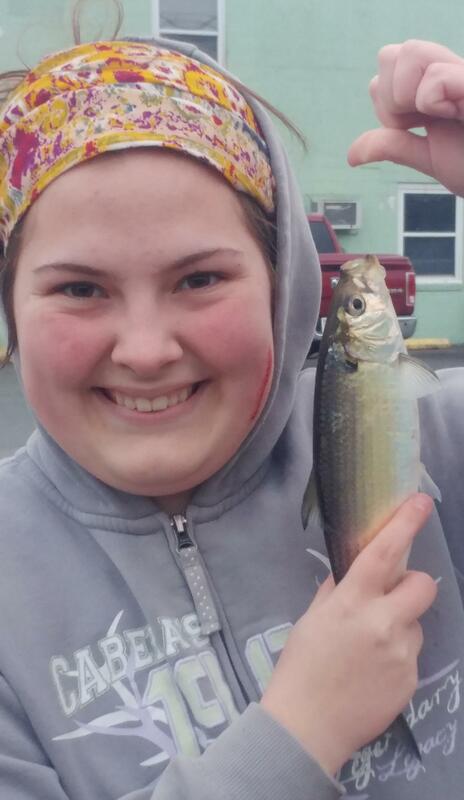 She landed her first ever alewife, one of the river herring here in Maryland. I mentioned that a hickory shad would be about 2 to 3 times this size. 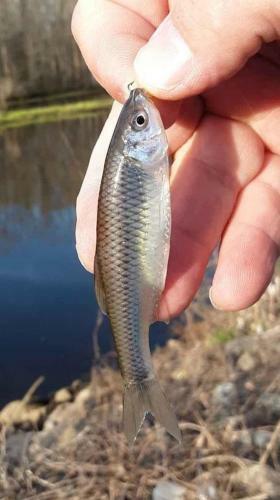 I will admit that I thought this was a blueback herring, but got confirmation that it was actually an alewife (the same species that I had caught a week earlier). Due to darkness and cold we got off the water. So in just about an hour Livie had caught 11 white perch, the alewife, and five yellow perch. I never did catch up, but ended the night with five whites, four yellows, and three redbreast sunfish. I still think that we missed the main part of the spawning run for the white perch. We still got into some fish and had a great time. Still keep thinking about those minnows. Once Livie is done with her performances this weekend we should be able to get back out to see if we can figure out what they were ! Thanks Daryk. I figure maybe another year or two before she will just spend a little bit of time with her old man. Taking advantage of what time we have together. Nice job Liv! Way to show your dad how to get it done! Congrats on the new species too John. I'll let her know. She had three performances this weekend so no fishing for anyone.